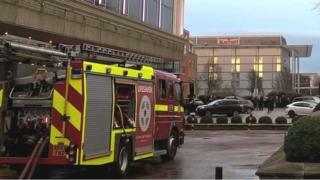 About 200 guests had to be evacuated from a hotel near Heathrow Airport after a fire broke out in a sauna. Eight fire engines and about 60 firefighters were called just after 16:00 GMT to the blaze at the Radisson Blu hotel in Bath Road. Crews from Hayes, Feltham and Hillingdon attended, and the fire was under control by 18.13 GMT, the London Fire Brigade said. No-one has been injured. It is not yet known what caused the fire.